Warning: major spoilers ahead for Episode 13 of Season 4 of Arrow. After the guest-star-palooza that took Season 4 in a few new directions last week with “Unchained,” Arrow went for what felt like a throwback to Season 3 in “Sins of the Father” as Oliver struggled to barter for Thea’s life. Although Nyssa demanded Malcolm Merlyn’s life in exchange for a cure for Thea at the end of the previous episode, Oliver managed to double-cross and de-hand Malcolm so that Nyssa would gain control of the League without anybody dying. Not one to take double-crossing lightly, Malcolm retaliated by revealing the existence of Oliver’s son to none other than Damien Darhk. And that could obviously have ridiculously horrible consequences. Honestly, Oliver probably should have decided to cut his losses and kill Malcolm as soon as he discovered that Malcolm knew about his secret kid in Central City. Oliver is definitely in the wrong for how he’s lied to Felicity about the secret kid, but nobody would have condemned him for killing the villain to protect the identity and life of an innocent. As we are in the midst of the February sweeps ratings period rather than May sweeps, however, this is the time for supervillains to survive and side characters to suffer. Malcolm living to tell his tale to Damien Darhk may well ruin Oliver’s life as he’s built it so far in Season 4. There’s always been a great deal of danger in Oliver letting Malcolm have his run of the Arrow cave, and “Sins of the Father” proved that Malcolm wasn’t wasting his access to all things Team Arrow. By revealing that he knows about Oliver’s hidden son in Central City, Malcolm showed his position of power over everything that Oliver holds dear. Really, it’s Oliver’s own fault that Malcolm went to Damien Darhk with the information. Few people on television are as predictable as supervillains when they’re given the motivation to do their dastardly deeds, and Oliver gave Malcolm plenty of motivation. Unfortunately, Oliver’s son may be the one to pay the price for Oliver’s mistake. Of course, Oliver only sees William whenever he decides to lie to his fiancée and visit Central City, so the devastation at any harm done to his son might be something that Oliver could compartmentalize away in his fight against Damien Darhk and H.I.V.E. What Oliver almost certainly could not compartmentalize away, however, is a breakup with Felicity. Season 4 has built up Oliver’s attachment to Felicity to the extent that he’s basically a barnacle to her soul. She’s with him on every front of his life. Oliver losing Felicity at this point is not something that he could believably brush aside. And let’s face it: Oliver is totally going to lose Felicity. Given that Malcolm Merlyn has ratted out William’s existence to Damien Darhk, it’s only a matter of time before Darhk makes his move on the secret branch of Oliver’s blood family. Felicity is bound to learn the truth of Oliver’s trips to Central City sooner rather than later. William and his mother may be able to be shipped off to ARGUS witness protection or move to Tahiti should they survive the wrath of Damien Darhk, but there may be no escaping Felicity’s wrath if she finds out about Oliver's secret kid via the evil man who crippled her. 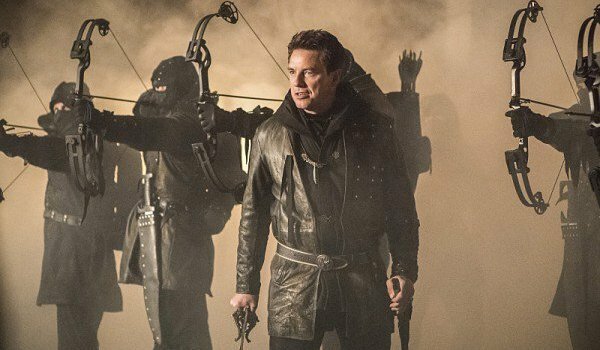 Oliver may have been happy that his solution to the West Side Story-esque standoff between factions of the League of Assassins ended without anybody dying, but he may come to wish that he had just gone ahead and decapitated Malcolm around this same time next week. Still, Oliver really shouldn’t be surprised that Malcolm channels Anakin rather than Luke Skywalker in response to having his hand chopped off. Malcolm was already a supervillain. No matter how far Damien Darhk goes with this information, the damage will be traced back to the moment that Oliver Queen pissed off Malcolm Merlyn so much that he gave up the details on a person that Oliver evidently dearly loves. Oliver’s life is likely to be ruined in some way by the end of February sweeps, and I for one can’t wait to tune in and see what happens next. Arrow airs on Wednesday nights at 8 p.m. ET on The CW.